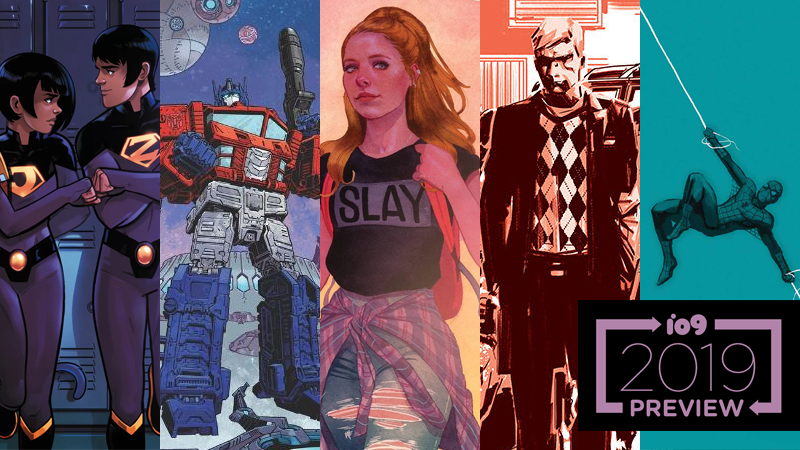 Wonders, transformers, slayers, weirdness, and life stories are waiting to be uncovered in 2019's comics. Marvel 80th Anniversary: Since 2019 marks 80 years of Marvel Comics (back to before it was even called Marvel), the company is harkening back to some of its oldest comic series from the Silver Age, anthologies telling tales of frights, outer space, and the harsh battlefields of war! Star Wars: Age of Republic: The Star Wars anthology series celebrating all three eras of Star Wars movies continues its trek across the characters and times of the prequel saga, with tales celebrating Jedi Knights, mysterious Bounty Hunters, Clones, and everyone’s favorite senator, Jar Jar Binks. IDW 20/20: IDW’s year-long celebration of its 20th anniversary kicks off with a weekly anthology series; it takes some of its most beloved series and imagines new tales set either 20 years in the future, or 20 years in the past. A new mission for Amanda Ripley. The hero humanity needs is the one willing to let it crumble in Peter Cannon: Thunderbolt. Can Earth’s mightiest save the light? Age of X-Man: The new Age continues, with new teams, new miniseries, and new sagas for Marvel’s mightiest mutants. Star Wars: Age of Republic: Tales from across the prequel saga continue, this time featuring stories about two Jedi: one knight already fallen, and another destined to bring down the Jedi Order with him. Sharkey’s on the hunt this February. A young girl comes back from a horrifying trauma in The Girl in the Bay. All of reality is at stake in Incursion. Kamala Khan’s world is expanding in March. Age of X-Man: The new Age continues (again! ), with more fresh miniseries from the mutant world. Star Wars: Age of Republic: The prequel exploration continues, with two new stories highlighting Senator Amidala’s political acumen and a shocking revelation for the sinister Separatist commander, General Grievous. Get ready to have H on speed dial again. A new age of Transforming begins! The life of one of Valiant’s most important characters is getting its own miniseries.